The injury bug has struck the Los Angeles Dodgers once again. 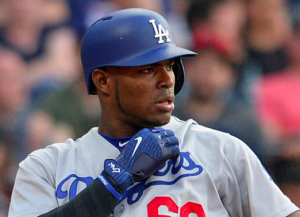 The club placed outfielder Yasiel Puig on the 10-day DL on Monday night because of a right oblique strain. Puig suffered the injury during Sunday’s loss to the Angels. The Dodgers aren’t sure of a timeline, but they expect to be cautious with Puig even though an MRI revealed only a Grade 1 strain. The injury to Puig could be a big one for the Dodgers in such a competitive NL West. Puig has started 68 of the team’s 90 games in right field, playing nearly every day aside from a brief stint on the DL with a bruised hip. He’s also been one of their most important offensive players since returning from that injury. On the season, Puig is hitting .265 with an OPS of .787. Those numbers are solid if unspectacular. However, he was hitting an abysmal .193 when he went to the DL in late April. But he’s been on fire since then, posting an OPS of .970 in May and .884 in June. Puig was also 8 for 23 with two home runs thus far in July before being struck down with the oblique injury. The silver lining for the Dodgers is that Puig going on the DL allowed them to bring up Andrew Toles. Toles was a key contributor the second half of the 2016 season. However, a torn ACL last May cost him most of the 2017 campaign. He’s been in the minors all season and will now have a chance to get regular playing time with the Dodgers. Toles made an immediate impact, going 2 for 3 with two RBIs during Monday’s win over the Padres. Toles should expect to step in for Puig as the team’s primary right fielder. The Dodgers are lacking in outfield depth outside of Enrique Hernandez and Chris Taylor. Of course, Taylor is currently the primary shortstop while Hernandez serves as a backup at nearly every position. That means the Dodgers need Toles to help replace the production they won’t be getting from Puig over the next few weeks. By the sound of it, Puig could be out at least a month. If Toles can re-establish himself in the majors during that time, the Dodgers may be better off for it. However, Puig has been an important player for the Dodgers over the past two months. With Los Angeles locked in a tight race with the Diamondbacks, losing him for an extended period of time could be a big hit to their division title hopes.